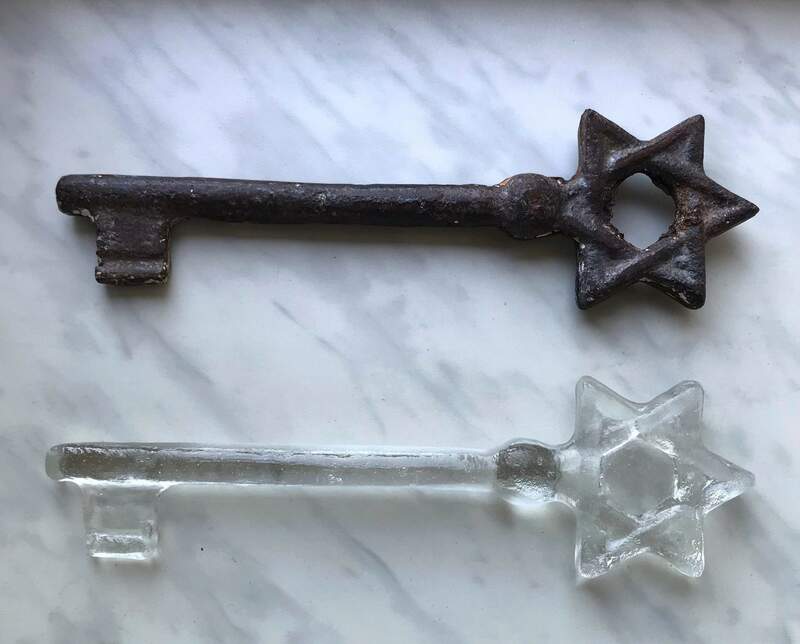 In this undated photo provided by artist Rachel Stevens an old synagogue key discovered by Stevens at a market in Lviv, Ukraine, and a glass replica that she made modeled on it are photographed. Seventy-five of the glass replicas were presented to people working to preserve the memory of the Jews of Lviv and the region during a ceremony marking the 75th anniversary of the destruction of the city’s Jewish community in the Holocaust on Sunday Sept. 2, 2018. 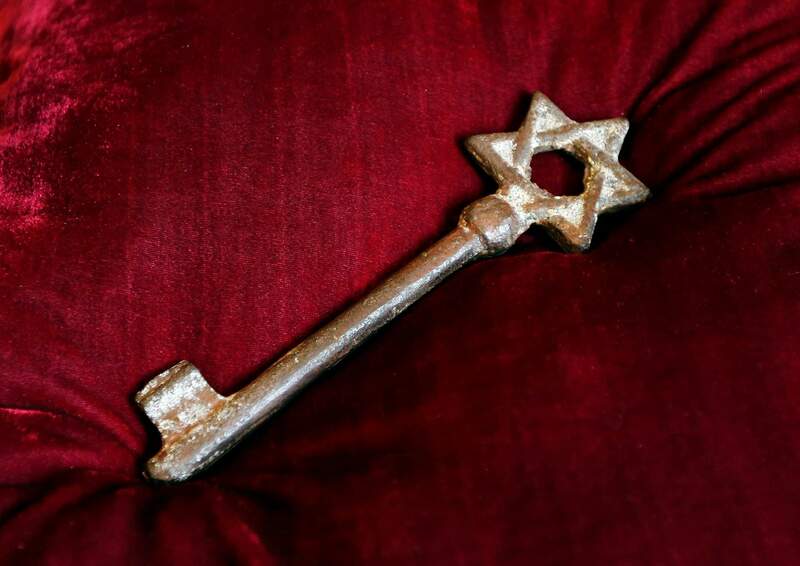 An old metal synagogue key discovered at an open-air street market in Lviv is presented at a ceremony commemorating the 75th anniversary of the annihilation of the city’s Jewish population by Nazi Germany in Lviv, Ukraine, Sunday, Sept. 2, 2018. 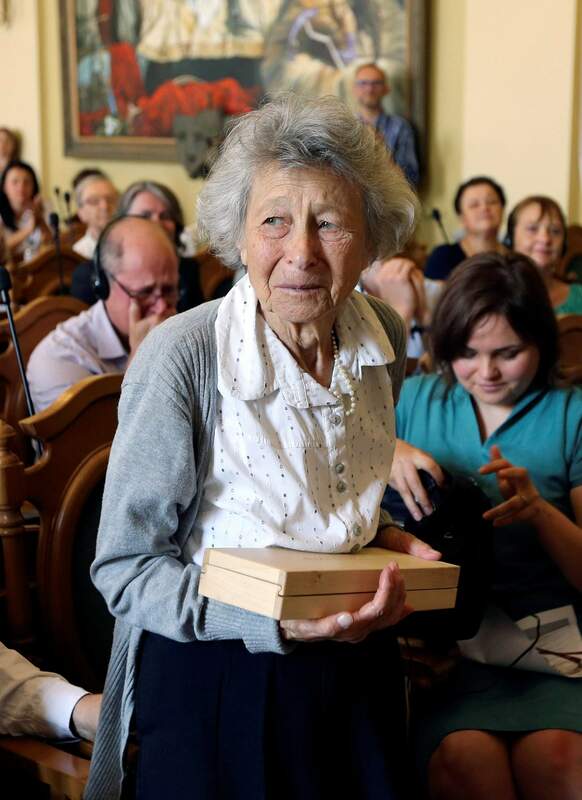 Yanina Hescheles, Polish writer and a Nazi concentration camp survivor, holds a glass copy of an old metal synagogue key at a ceremony commemorating the 75th anniversary of the annihilation of the city’s Jewish population by Nazi Germany in Lviv, Ukraine, Sunday, Sept. 2, 2018. The Ukrainian city of Lviv, once a major center of Jewish life in Eastern Europe, is commemorating the 75th anniversary of the annihilation of the city’s Jewish population by Nazi Germany and honoring those working today to preserve that vanished world. The commemoration comes amid a larger attempt in Ukraine to preserve the memories of the prewar Jewish community. 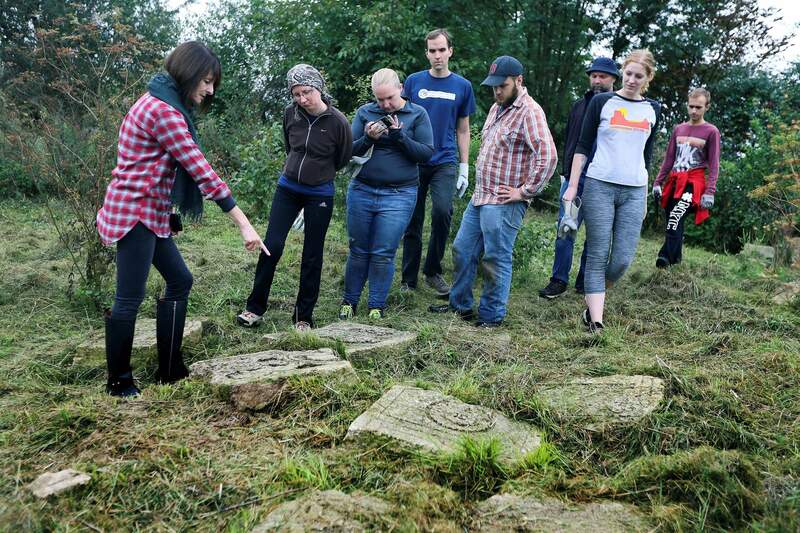 U.S. citizen Marla Raucher Osborn, a Rohatyn Jewish heritage project leader, left, shows volunteers the gravestones at an old Jewish cemetery in Rohatyn close to Lviv, Ukraine, a few days before the 75th anniversary of the annihilation of the city’s Jewish population by Nazi Germany. The commemoration comes amid a larger attempt in Ukraine to remember and celebrate the lost Jewish world in a part of Ukraine that before World War II was part of Poland and was the third largest Polish Jewish community. 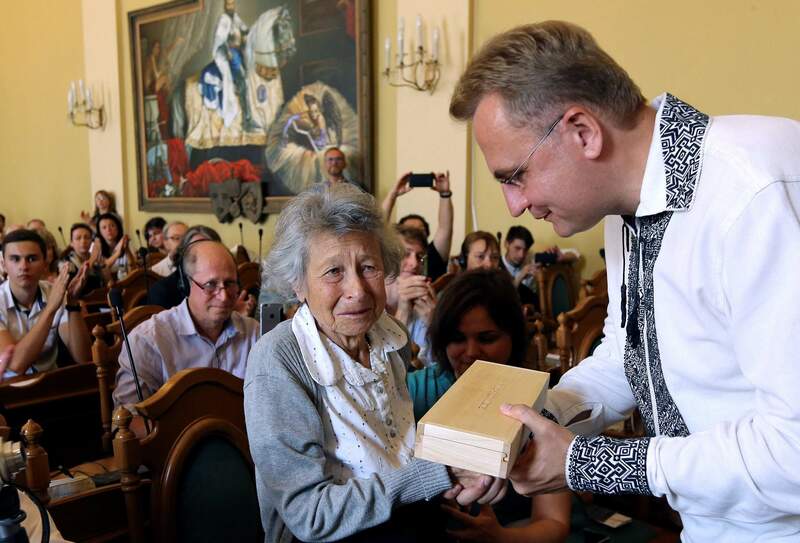 Lviv Mayor Andriy Sadoviy, right, presents a glass copy of an old metal synagogue key to Yanina Hescheles, Polish writer and a Nazi concentration camp survivor, at a ceremony commemorating the 75th anniversary of the annihilation of the city’s Jewish population by Nazi Germany in Lviv, Ukraine, Sunday, Sept. 2, 2018. LVIV, Ukraine – The Ukrainian city of Lviv, once a major center of Jewish life in Eastern Europe, commemorated on Sunday the 75th anniversary of the annihilation of the city’s Jewish population by Nazi Germany and honored those working today to preserve what they can of that vanished world. 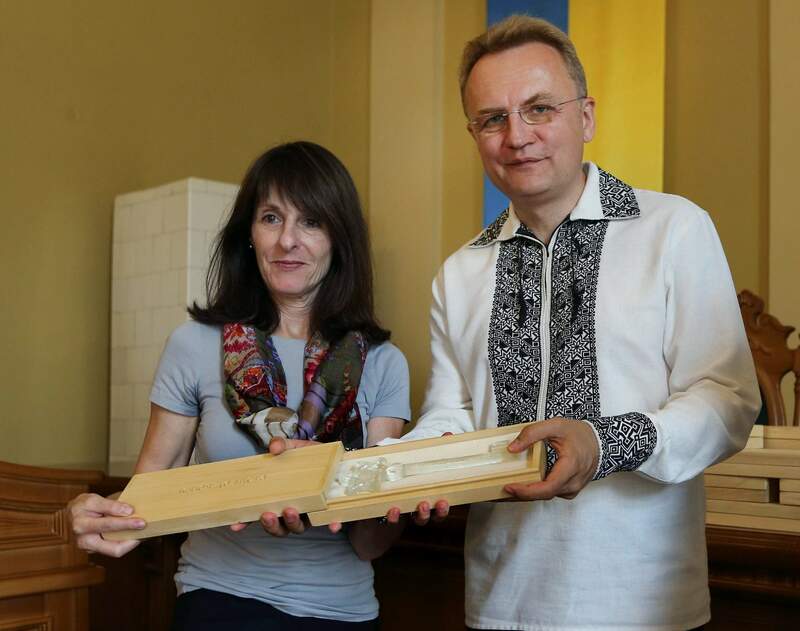 Lviv Mayor Andriy Sadoviy, right, presents a glass copy of an old metal synagogue key to Marla Raucher Osborn, a Jewish heritage project leader, at a ceremony commemorating the 75th anniversary of the annihilation of the city’s Jewish population by Nazi Germany in Lviv, Ukraine, Sunday, Sept. 2, 2018. The commemoration comes amid a larger attempt in Ukraine to remember and celebrate the lost Jewish world in a part of Ukraine that before World War II was part of Poland and was the third largest Polish Jewish community. 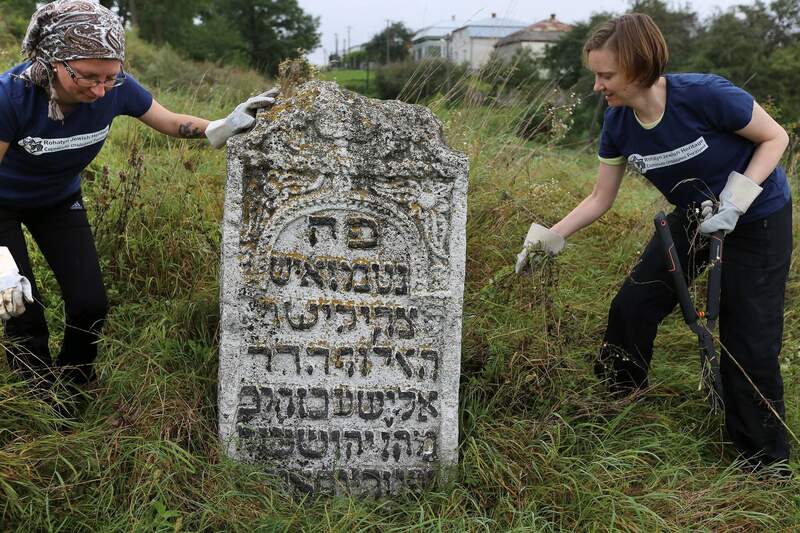 Volunteers clean an old Jewish cemetery in Rohatyn, the site of a Jewish Heritage project, close to Lviv, Ukraine, a few days before the 75th anniversary of the annihilation of the city’s Jewish population by Nazi Germany. The Ukrainian city of Lviv, once a major center of Jewish life in Eastern Europe, is commemorating the 75th anniversary of the annihilation of the city’s Jewish population by Nazi Germany and honoring those working today to preserve that vanished world. The commemoration comes amid a larger attempt in Ukraine to preserve the memories of the prewar Jewish community. Among those honored was Marla Raucher Osborn, an American who heads Rohatyn Jewish Heritage . The group’s projects include restoring a Jewish cemetery in nearby Rohatyn. Stevens used glass for the replicas because in Jewish tradition the material “represents the fragility of life.” Creating them “became a tangible way for me to express my grief about the past and my hope for the future,” she said. “The idea for this artwork seems almost mystically delivered to me,” Stevens said.